Angie is currently engaging in a research programme with the Dublin Institute of Technology to investigate how physical activity can help prolong and improve the quality of life of older adults. The programme is titled Active Leisure and Aging in Rural Ireland : Comparing Perceptions and Self-belief of Native and Non-Native Irish Populations. Angie hopes to investigate the attitudes and perceptions in 3 different age cohorts: 18-50 years, 50-64 years and 65+ years. This will involve data collection through interviews and focus groups of local individuals and groups as subjects in this research over the next 3 years. Angie is also working with the Men’s Health Forum to develop an initiative of health promotion and activities for adult males who may not have participated in traditional male sports and other members of the local, rural community, based on her findings in the primary research phase. If you want to find out more about her research, or indeed volunteer to be a part of the study, please don’t hesitate to contact her. 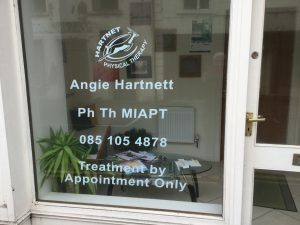 Angie has utilised her teaching background in further education working as a tutor on the Musculoskeletal Anatomy and Analysis module of the BSc in Applied Healthcare programme for the Institute of Physical Therapy & Applied Science (IPTAS) since 2014. She was also a lecturer for the Galway Roscommon Education and Training Board (GRETB) on the Sports Massage module of the Advanced Diploma in Health Science, Sports Nutrition and Personal Training (2017).